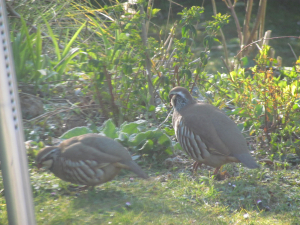 Observation - Red-legged Partridges in the garden - UK and Ireland. Description: Surprised to see this pair near the feeders.It was & early so they may have followed the pheasant pair.Have seen them rarely in nearby fields. Surprised to see this pair near the feeders.It was & early so they may have followed the pheasant pair.Have seen them rarely in nearby fields.